I am so glad to learn that all of you have been such a great help to Locana there in our Berkeley centre. I can understand that all of you are very sincere boys and girls and are very eligible candidates for going back to home, back to Godhead. And the process is simple. Follow the regulative principles, chant at least 16 rounds of beads daily, read our literatures, go for street Sankirtana, etc. In this way keep yourselves engaged in Krishna's business 24 hours and you will be really happy in this life and in the end reach the Supreme destination. Hoping this will meet all of you in good health. Please accept my blessings. I am in due receipt of your letter of November 17, 1971, and I am especially pleased that the church owners in Dallas have accepted our offer of $26,000 down payment. I have seen one copy of the contract sent to me by Karandhara. It seems all right. One thing: What are the monthly payments? Now you organize our KC school very nicely on the basis of a kindergarten school and primary school for children up to 15 years old. That is a good proposal, that parents should not accompany their children. Actually that is the gurukula system. The children should take complete protection of the Spiritual Master, and serve him and learn from him nicely. Just see how nicely your brahmacaris are working. They will go out in early morning and beg all day on the order of the guru. At night they will come home with a little rice and sleep without cover on the floor. And they think this work is very pleasant. If they are not spoiled by an artificial standard of sense gratification at an early age, children will turn out very nicely as sober citizens, because they have learned the real meaning of life. If they are trained to accept that austerity is very enjoyable then they will not be spoiled. So you organize everything in such a way that we can deliver these souls back to Krishna--this is our real work. Some of our girls may be trained in colleges and take teacher exams, and their husbands also. As you develop our program there I shall give you more hints. As for the extra room, that may be utilized in future as classrooms as our school program expands. But for the time being why not open a hostel for the hippies? I want that all the hippies should come to me and I shall solve their problems. Actually all these hippies should join us. I am seeing that in this Delhi city many hippies from your country are coming, but they are simply hungry and dirty and being cheated. During our pandal program some of them came to me and became my disciples. So we must look out for them and take interest that they should be delivered from this miserable condition. They are our best customers. If we give them place to sleep comfortably and nice prasadam, and if they agree to follow the four rules and attend our aratis and classes, why not invite the hippies to live with us? Gradually they will become devotees. The American Ambassador to India, Mr. Kenneth Keating, is very much in favor of our Movement, especially on this point of giving you people the right advice and saving them from intoxication and being hippies. If your government would give us some help I can save all of them. That would be a great blessing for your country. Otherwise this hippie class will simply spoil everything they have worked so hard for. Please accept my blessings. I have received your letter of November 3, 1971, along with the six letters requesting initiation and the daksine sum. By your recommendation, I am happy to accept the six as my disciples and their names shall be as follows: 1) Joan Cerando/Ratnesvari Dasi; 2) Larry Batcheldor/Lokanatha Das; 3) Barbara Batcheldor/Vrajasundari Dasi; 4) John Warren/Yogescandra Das; 5) Beverly Warren/Varahadeva Dasi; 6) Tom Hopke/Nalinikanta Das. I am replying all of them separately also. I am very pleased that you have accepted the responsibility of managing such an important center as Berkeley. I know that there are many students in that city, so just attract them to our Krishna Consciousness Movement by giving them prasadam and our Krishna philosophy. We can challenge any nonsense philosophy. Socrates, Plato, Kant, Darwin--all of them--so many mental speculators and word jugglers who have misled so many people. Now it is your task to find them out and expose them, so that the people may appreciate the real philosophy. We must become now very serious to save the people of the world from this very dangerous situation. So become very convinced yourself of our philosophy and then your preaching will act. And try to sell as many books as possible at all the schools and colleges. This is scholarly information, flawless science. Kindly assist me in this great work, and know it for certain, that by your sincerely working in this way you shall very soon go back to Home, back to Godhead. Please accept my blessings. I have received your letter undated, and have noted the contents carefully. I am very pleased by your attitude to surrender yourself completely by engaging cent per cent in Krishna's service. Somehow or other always to be thinking about Krishna, that is the goal of Krishna Consciousness process. So now you please help me to spread this information all over this earth planet, especially by helping to distribute my books and literatures, as many as possible. Then you will get the credit, and know it for certain that very soon you will go back to Home, back to Godhead. I hope this finds you in good health and cheerful mood. Please accept my blessings. I am in due receipt of your letter of November 7, 1971, and I am very pleased to note that we have now got our center in Ottawa, Canada. I understand that Ottawa is the seat of government and a very important place. A few days back, the Canadian High Commissioner to India, Mr. James George, came to our festival which we are holding every night for two weeks in the central square of Delhi as the special Guest for that night. He garlanded me and spoke many nice words about our Movement, which he has observed for some time in Montreal and Boston. He is very favorable to our Movement. It appears that more and more the gentleman class of men in your country is respecting this Krishna Consciousness Movement, so you should approach them one by one and convince them very tactfully to help us. A man is known by his notions and by his words. But sometimes it may appear that he is doing something, but he may be thinking something else. So a man is really known when he speaks, then everything is revealed. So if this Mayavadi sannyasi does not speak, then he can fool everyone. But if you force him to speak he will expose himself, therefore he is silent. Even he remains silent, we shall speak very loudly and expose these bogus men. Let our philosophy be challenged by anyone and we shall defeat them. I want that you distribute our books very widely, as many as possible, then people will get the right information. We show people by the results: so many centers, happy devotees, big books, strong conviction--like that. Let people judge who is better by the results. As far as your marriage, I have no objection if you marry in a civil wedding, but so far a Krishna Consciousness wedding, there is no question until the girl has been initiated. I am so glad to learn that you have been such a great help to Satsvarupa there in our Boston centre. I can understand that all of you are very sincere and are very eligible candidates for going back to home, back to Godhead. And the process is simple. Follow the regulative principles, chant at least 16 rounds of beads daily, read our literatures, go for street Sankirtana, etc. In this way keep yourselves engaged in Krishna's business 24 hours and you all will be really happy in this life and in the end reach the Supreme destination. Please accept my blessings. I have received your letter of November 7, 1971 xerox copy, and have noted the contents carefully. I have sent under separate cover the initiation beads for Andrew Day, Martin Lewis and Jill Lewis, duly chanted on. Their new names shall be Mathuresh (The Lord of Mathura), Raghavendu (The moon in the Raghu dynasty), and Vijay Laksmi dasi, respectively. I am happy to accept them as my sincere disciples, now you give them all good advice how to push on this Krishna Consciousness Movement. Let them know it for certain, that something given to Krishna is never lost or wasted, and if they are determined they may go back to Godhead, very soon. If they like, you may perform a Krishna Consciousness wedding ceremony for the married couple. I am very much encouraged that the school building may be purchased in the near future. But one thing, how the $30,000 is to be paid and wherefrom you have got so much money? 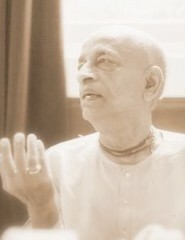 I am very much anxious to open schools for educating children of responsible leaders in our Krishna Consciousness way of life, especially also in India. If these leaders simply become a little convinced about the real purpose of human life, there is tremendous potency for improving the world. Last night the topic of my lecture at our Delhi pandal was the necessity for teaching Krishna Consciousness in all our schools and colleges. This is a revolutionary thought. But we have seen that the practical outcome of so much hippies, one after another. What is the use of their skyscraper buildings if their sons will not maintain them? The old system of gurukula should be revived as the perfect example of a system designed to produce great men, sober and responsible leaders, who know what is the real welfare of the citizens. Just as in former days, all big big personalities were trained in this way. Now you have got the responsibility to inject this idea in your country. Please do it with a cool head, and very soon we shall see the practical benefit for your countrymen. Yes, preaching is more important than managing. Just because you are preaching nicely and distributing so much prasadam, the management will follow like a shadow and Krishna will send you no end of help. Please accept my blessings and the blessings of Lord Caitanya also. Because you have done the Caitanya Mahaprabhu murti so wonderfully, I can understand that Caitanya Mahaprabhu had a special blessing upon you. So you first introduced Tulasi plant in the Western countries and now you have introduced the vigraha form of Lord Caitanya in the Western countries. So do it very nicely and very soon I shall be coming to your New Navadvipa by the month of March or April. The Panca-tattva can all be golden. The Deity of Lord Caitanya is very nicely done so there is no need to change the color. Yes, Srivas Pandit has sikha. Vaisnava must have sikha. Advaita Prabhu has a full white beard. He was an old man. He was practically older than the father of Lord Caitanya. He was an elder gentleman in the town of Navadvipa, elder of the brahmana community. All should wear Tulasi kunti beads, not less than two strands. Three, four strands or my Guru Maharaja had five strands. Only Lord Caitanya and Lord Nityananda wear crowns and nosepins. Lord Caitanya and Lord Nityananda can be decorated with all kinds of jewelry. For Krishna Tulasi and Rama Tulasi the the worship is the same. There is no difference between Rama and Krishna. Both are the Supreme Personality of Godhead. Simply they are expansions of the same Absolute Truth. This is very good that these leaders of this local yoga group have joined with us. This is great credit. All the hippie groups can be transformed into Krishna Consciousness by your regular preaching. You have already experienced that our transcendental mantra of Hare Krishna and distribution of prasadam will make us successful all over the world. Those who are intelligent can read our books very seriously and their lives will become perfect. Our method is very simple. The preacher should also be ideal, sincere, serious and strictly adhering to our principles, chanting 16 rounds and following the restrictive rules. Please accept my blessings. I am in due receipt of your letter dated November 7, 1971, and I am encouraged to note that things are going on nicely at Austin center under your supervision. I have seen the photo-slides sent by Hayden Larson and William Walsh and they are first-class. Please give them all facilities to finish this work nicely. If Bill Prabhu holds a university post, then that is a very important position for spreading Krishna Consciousness and he should try to keep it as long as it will be beneficial in that way. My Guru Maharaja used to say that anything material, if it is used in the service of Krishna, it is a mistake to give it up. I am pleased also to learn that you are teaching university course in Krishna Consciousness. Try to make this program very stimulating for all the students at the university by challenging anyone and everyone to try to defeat our Krishna philosophy with their philosophy. If such discussions can be held they will be very lively and the student body may take note and enroll in increased number. Philosophy is the highest knowledge, but even higher than philosophy is the practice of philosophy. So if your students can be enticed to practice Krishna philosophy, they will feel the practical benefit and become convinced, that is Lord Caitanya's process. As more students become involved in our philosophical discussions, you will be able to sell them our books. I want that my books and literatures should be very widely distributed, as many as possible. I have received the letter from Hayden and Bill Prabhus of October 14, 1971 but there is no mention of initiation. I don't think I have received any other letter from them. However, because you have recommended them, as soon as I shall receive any letter from them requesting to become my disciples, I shall gladly accept them. Regarding your proposed festivals, yes, that is a good idea. Please do it very nicely. These public festivals have proven very effective in spreading knowledge about Krishna Consciousness to all the citizens. In fact, I have directed the GBC to organize such festivals and travelling sankirtana throughout their zones. The festival we are holding at present in Delhi has been extremely successful, and by Krishna's grace everyone is appreciating this Movement by seeing the beautiful deity worship, by hearing the melodious kirtana, and by seeing the bright faces of my students. To answer your last point, one who teaches can be treated as Spiritual Master. It is not that after we become initiated we become perfect. No. It requires teaching. So if we take instruction from them, all senior godbrothers may be treated as guru, there is no harm. Actually, you have only one Spiritual Master, who initiates you, just as you have only one father. But every Vaisnava should be treated as prabhu, master, higher than me, and in this sense, if I learn from him, he may be regarded as guru. It is not that I disobey my real Spiritual Master and call someone else as Spiritual Master. That is wrong. It is only that I can call Spiritual Master someone who is teaching me purely what my initiating Spiritual Master has taught. Do you get the sense? I hope this finds you well and cheerful. Please accept my blessings. I am in due receipt of your letter of November 12, 1971, and have noted the contents with encouragement. But one thing, what do you mean Gaura Hari was held in jail? Please convey my blessings to Mrs. Dossa. Her husband was a very great devotee who was taken away by Krishna for promotion, and she may rest assured that he has progressed on the path of going back to Home, back to Godhead. She should follow in her good husbands footsteps and become fully Krishna Conscious and in this way she will find herself fully happy. You must give her good guidance and all facility in this respect. I am very pleased that you are making arrangements for the 1st ANNUAL PUSPABHISHEKA YATRA PARADE AND FESTIVAL, 1971, and if he is free to come, Visnujana Swami may come to lead the kirtana and preaching. That is a good proposal. Krishna was just a toy in the hands of the Gopis, so one day the Gopis decided that we shall decorate Him. Pusyabhisheka means a ceremony to decorate the deity profusely with flowers, ornaments, cloths. After there should be lavish feasting and a procession through the streets, so that all the citizens should see how beautiful Krishna appears. As soon as He is prepared, Lord Jagannatha may come there to live. Someone like Karandhara who is experienced may install the deity nicely. It is very nice that you have won the favor of Srimati Tulasi Devi, and that she is prospering under your careful attention. That is a good sign. Please accept my blessings. I am in due receipt of your letter of October 24, 1971, and have noted the contents carefully. Due to our always moving about I have not had opportunity to answer until now. Please forgive me. I am very encouraged to hear how San Diego center is flourishing under your supervision. The test is that so many new devotees are coming. That is a very good sign. Now you must take care to train them very nicely. They are voluntarily giving their lives to Krishna, so as president you must see that they are always happy and satisfied in Krishna Consciousness. Then they will not go away. Your proposals for teaching them our philosophy are very good. But if we try artificially to explain sastra in our own words, there is every danger of interpretation and speculation. First the student must be able to repeat exactly the words of the guru and then after some time he may be qualified to apply the principles he has learned word-for-word to personal situations. It is not that we are a dry philosophy of dogmas and slogans. No. The language of Krishna Consciousness is ever-fresh and we can explain everything by it, just like my Guru Maharaja once lectured for three months on one verse from Srimad-Bhagavatam. But every precaution must be taken to preserve our basic guiding principles as they are and not change them because we want to hear something new. It is very nice that you are holding festivals in San Diego center. We are finding these festivals very successful for attracting the citizens to our activities. More and more these festivals may be held, at least very large festival in a year, simply for glorifying Krishna in public places. It is not that a specific holiday or theme has to be chosen. We are simply calling our Indian programs A Hare Krishna Festival. But if there are some holidays you specifically like, you plan them together with Karandhara by adjusting to the local taste. I am very pleased that your literature sales are increasing. I want this especially, that my books be sold everywhere, as many as possible. Kindly do this and I shall be very pleased. As per your recommendations, I am sending under separate parcel the initiation beads for Lynne Stowers, duly chanted on. Her name shall be Srila Dasi. I am pleased that she has become my disciple, now let her very seriously take up this process and she can know it for certain that there will be no more coming back to this place of miseries. Please accept my blessings. I am in due receipt of your letter of November 4, 1971. I am very pleased to hear that you have got some more devotees to assist you. Now you plot out a program with them how best to spread Krishna Consciousness in Japan. Our process is to infiltrate. We should not bother very much for their red tape, just rely on Krishna and by our determination everything will happen nicely according to His plan. These governments exist only for saying no, so I am not very optimistic that any government will ever help us. Sankirtana means preaching, so for some time try in other ways to spread our Krishna philosophy anywhere and everywhere, by selling books, as many as possible, by holding kirtana and classes in schools and college--wherever there is preaching, that is Sankirtana. You have an American brain, now use it to think of new ways to preach in Japan. As you have recommended, I am sending under separate parcel a set of initiation beads for Randy Prabhu, duly chanted on. His new name shall be Rama Dulal das Brahmacari. I am also sending one copy of Gayatri mantra and sacred thread duly chanted by me to Shatyananda das. Hold a fire yajna and give Gayatri to Shatyananda. If you do not have one, you can get a copy of a tape of me reciting Gayatri mantra from Karandhara. One thing is that the tape should be heard through earphones into the right ear. The fire yajna can be held for both devotees. The plant which you sent me is not Tulsi devi. I have no special instructions concerning Dai Nippon at this time. I shall probably be coming there to Tokyo on my return to Los Angeles by late Spring, I will let you know the date as soon as possible. Please accept my blessings. I am in due receipt of your letter of November 7, 1971, and I am encouraged to note that you are working very nicely in Krishna Consciousness, despite being there in a foreign land with so many obstacles. This kind of service is especially appreciated by Krishna, that some devotees should take risk for His preaching work. And my Guru Maharaja repeatedly requested his disciples to go out into far-off lands for spreading the message of Lord Caitanya. Thank you very much for this. Regarding your cookbook, I have turned it over to Malati and Yamuna Prabhus who are with me in Delhi, along with their husbands, to go over the contents carefully and then I will finish the final editing and send it to you very soon. I will write a brief introduction as you desire. Sankirtana means preaching. So if you are regularly holding classes, street Sankirtana may be postponed until the proper time. Meanwhile it is very encouraging that Dinesh Prabhu may be starting to teach classes in Vedic literature at Tel Aviv University. Just try to give this Krishna philosophy to the intelligent class of men, and distribute our books as many as possible, and your all efforts will come out successful. Know it for certain that by this your sincere working for Krishna, very soon you will go back to Home, back to Godhead. I have notified the GBC that they should supply you with more men as they are required by you, so when that time comes you may apply to Syamasundara, who is travelling with me, or to Karandhara or Rupanuga in the US and they will do the needful. I hope this meets you, your good husband, Dinesh, and your daughter Visnu Arati dasi in good health and cheerful mood. Please accept my blessings. I am in due receipt of your letter of November 3, 1971, and I am very pleased to note that things are improving nicely in Europe in general. I am glad to hear that Vasudeva has returned and is working cooperatively. He is a good boy, but sometimes in a weak instant Maya can capture us and we cannot resist. That is why I am always urging my students to follow the regulative principles without fail and to resist the onslaught of Maya by chanting Hare Krishna at least 16 offenseless rounds daily. In this way Krishna protects us. I have not received any letters from Peter Kaufmann and Jan Plantoner for initiation, but as soon as I do I shall be glad to accept them as my disciples, on your recommendation. * I shall send under separate cover sacred threads for Bidhan Candra and Jaya Gaura das Prabhus, duly chanted on, as well as two copies of Gayatri mantra. Hold a fire yajna and give them both Gayatri mantra. Yogesvara had a tape of me reciting Gayatri mantra, so you can get this from him. One thing is that the tape should be heard through earphones into the right ear. If letters from the two boys come I shall be sending their beads also. So if you like you may wait and the fire yajna can be held for all four devotees. I note that you have opened a Consolidated European BTG and BKF account for all European temples. Does this include England centers also? Won't the exchange difficulties between countries hinder such a plan? How have you arranged this account? Regarding your question about incense, Karandhara has just informed me that our Spiritual Sky incense business is making now $1,000,000 a year to spend for Krishna. How can that be Maya? My Guru Maharaja used to say, "Anything material, if it is used for the service of Krishna, it is a mistake to give it up." Because I have understood this principle, he used to appreciate me in front of my godbrothers. I have given this idea all along--why you big leaders do not understand it? You should take it to heart as a guiding principle that somehow or other we always please Krishna by doing what is practical and necessary, according to time and place. Not that we should be whimsical. But one test is that all the devotees should be satisfied. They have given their lives to Krishna, so we should see they are always happy. Their service is voluntary. It is not that we can force anyone to do anything. If we do they will go away and that is a great loss. Everyone must be encouraged to do what he likes to do for Krishna, so if someone likes to do business for Krishna, let them make $1,000,000 for Krishna. I hope this finds you and your good wife, Himavati dasi, in strong health and cheerful mood.